Here's why many folks are going the DIY mattress route - it's cheaper and you can build a piece at a time. Buying a mattress online can be a stressful project with so many to choose from and how do you know it's going to be right for you? Here's a solution- build it one or 2 pieces at a time! 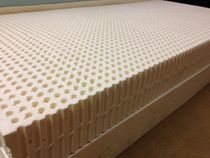 All mattresses are made with a series of components from springs to various layers of foam and even latex layers. 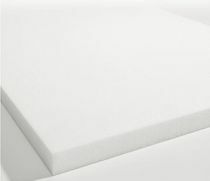 If you are tired of wasting money on inferior quality mattresses well maybe it's time you take a stab at building your own with our quality components. Most mattress industry professionals would agree that the first place to start is with a "firm" base. Whether that is our Combi-zone pocket coil system or a 3" or 6" firm latex base core is up to you. Next will be your comfort layer, this is usually in the "medium" range and is usually 3" thick. If you are looking for an overall firm feel then this may be all you need. If you already have your own topper this can be substituted or added at this point. 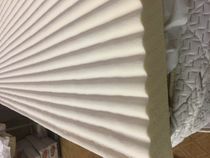 Finally for those who prefer the feel of a pillow top will be the top layer, usually on the softer end of the spectrum. 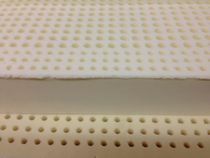 A common configuration is a 6" firm base core (or combi-zone pocket coil) then a medium 3" latex topper topped off with a soft 3" layer. This way you can rearrange the layers to tweak the overall feel. The soft layer does not have to be on top, you can put the medium topper there and the soft underneath to change up the feel a little firmer. Those on a budget will just cover everything with a zippered mattress protector or sheet or both and enjoy the thousands of dollars they just saved with their DIY Latex Mattress project. 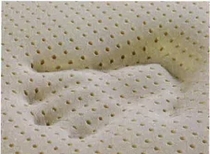 About half our DIY mattress customers do buy 3 layers of different firmness levels for the optimal amount of choices and sometimes will even add a 4th layer of either 2 or 3" for the final tweak. Of course if you already have a nice topper then you may only need one or 2 layers to complete your dream bed. 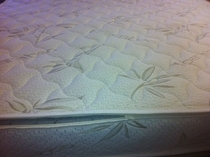 If you have an existing zippered mattress cover then make sure to measure and order the appropriate sizes to fit. Any questions about that please feel free to call for advice. All of our DIY mattress components are sold with a strict no return policy but are guaranteed to be exactly as advertised. If you are looking for trial periods and 20 year warranty then our pre-configured models like our Adjustable Ultra Plush would be a much better choice.